Elvis in October—October was a month of momentous events in Elvis Presley’s life and career. It was the month during which he sang for the first time at a public event. At age 10 he sang “Old Shep” at the Mississippi-Alabama Fair and Dairy Show. Two of his legendary concerts of the 1950s happened in October—before over 26,000 people at the Cotton Bowl in 1956 and at the Pan Pacific Auditorium in Los Angelels in 1957. It was also in October that he arrived in Germany for his army service. In his personal life, his marriage to Priscilla officially ended in October 1973. October 3, 1945 — A ten-year-old Elvis sang “Old Shep” at the Mississippi-Alabama Fair and Dairy Show in Tupelo. October 11, 1956 — Elvis appeared before 26,500 fans at the Cotton Bowl in Dallas. It was the largest crowd to see him perform in the 1950s. October 17, 1957 —Jailhouse Rock, Elvis’s third movie, premiered in Memphis. Elvis did not attend. October 28, 1957 — Elvis gave his infamous concert at Los Angeles’s Pan Pacific Auditorium. Complaints about the show caused the city vice squad to film Elvis’s show the next night to make sure he didn’t violate the city’s indecency law. 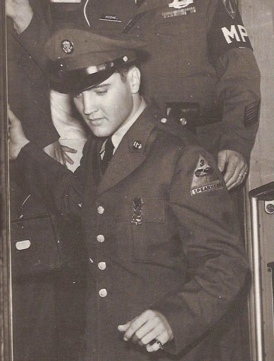 October 1, 1958 — Elvis arrived in Germany aboard the U.S.S. Randall to start his army deployment there. October 15, 1961 — Elvis recorded “Good Luck Charm” at RCA’s Studio B in Nashville. October 23, 1968 — Elvis’s 28th movie, Live a Little, Love a Little, opened in theaters nationwide. October 9, 1973 — Elvis and Priscilla’s divorce was finalized at the Los Angeles County Superior Court House in Santa Monica. October 29, 1976 — Elvis’s Jungle Room recording sessions began at Graceland. On October 2, 1956, Chicago radio station WAIT conducted a 12-hour marathon of Elvis records. Starting at 7 a.m., the station started broadcasting 33 Elvis records over and over. When it was done, the station reported the following results. • One woman called to say she was canceling her dental appointment so she could stay home and listen. • Another inquired when there would be a break for a long newscast. She wanted to hang out her wash but didn’t want to miss any songs. 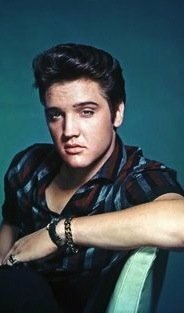 • The mother of a 6-month old youngster said the baby usually cried all morning but went to sleep peacefully as Elvis crooned. • A woman said she hadn’t missed work in more than two years but was playing sick to stick near the radio. • Many mothers reported they had no trouble getting their teenagers up for school. The trouble was getting them off to school. 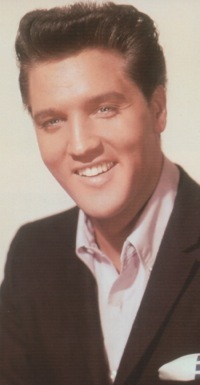 In its October 9,1968, issue, Variety reported that, “One of the biggest long-running attractions to hit Australia is not even a person but a car—Elvis’ Gold Cadillac.” Bill Walsh, general manager for RCA Victor Records in the Southwest Pacific area, had arranged with Colonel Parker for Presley’s car to be brought to Australia for a year-long tour to benefit the charitable causes of the Benevolent Society of New South Wales. The auto arrived in Sydney on January 19, 1968. By October more than 400,000 Aussies had viewed the car at the admission charge of 30¢, for a total of $128,000. By the end of its tour, the total take was expected to be $165,000. Parker had insisted that “every single cent that came in was to go to the Society,” and that there were to be no expenses charged against it, either. The largest crowd to see the car had been at Sydney’s Royal Easter Show in April. It drew 22,500 curiosity seekers. By October the car had visited all of eastern Australia, with upcoming visits planned for Tasmania, Adelaide and Perth. The car was being transported in a special truck donated by a car agency. With Elvis’s Caddy drawing so many fans, just imagine the crowds that would have come out to see Elvis himself had he ever chosen to tour Australia. October 1 — Walter Mathau, Elvis’s costar in King Creole, was born in 1920. He died in 2000. October 1 — Stella Stevens, Elvis’s costar in Girls! Girls! Girls!, was born in 1936. October 16 — Angela Lansbury, who played Elvis's mother in Blue Hawaii, was born in 1925. October 17 — Julie Adams, who played Elvis's boss in Tickle Me, was born in 1926. October 18 — Chuck Berry, Elvis’s contemporary rock ’n’ roller and author of several songs recorded by Elvis, including “Memphis” and “Promised Land,” was born in 1926. He died on March 18, 2017. October 20 — Wanda Jackson, known as the "female Elvis Presley," was born in 1937. A pioneering female rockabilly singer, she toured with Elvis in 1955-56. October 20 — Dolores Hart, Elvis’s costar in Loving You and King Creole, was born in 1938. October 24 — Jennifer Holden, who costarred with Elvis in Jailhouse Rock, was born in 1936. October 26 — Don Siegel, who directed Elvis in Flaming Star, was born in 1912. He died in 1991. October 26 — Neal Matthews, a member of the Jordanaires, was born in 1929. He died in 2000. “I remember this blond girl in Atlanta. She came to three different shows. And she sat in the first row and screamed all through all of them. The night we closed she decided to come up on the stage and almost got up there, when about five policemen grabbed her and she was screaming ‘Let me at him.’ It broke up the house and I got so tickled I had to walk off that stage.” — The New York Post; October 4, 1956.